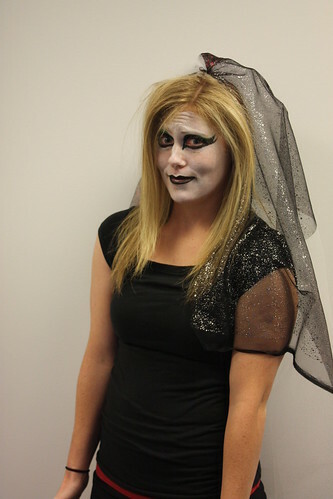 Happy Halloween from the Brides of Frankenstein! 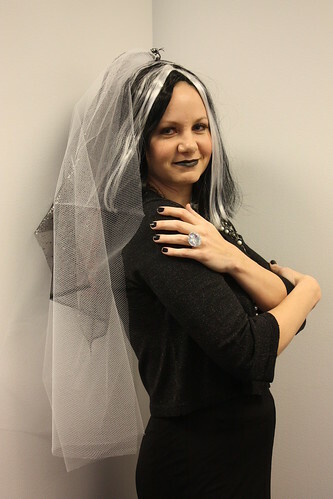 Jennifer was kind enough to make all the brides these amazing black and white tulle veils. 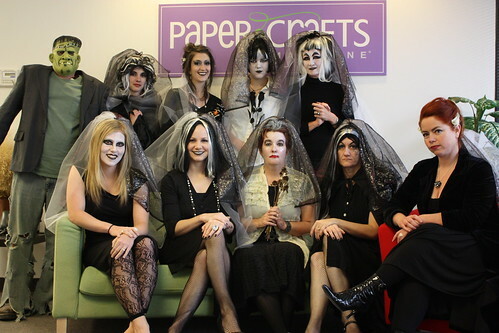 Add a wardrobe of black fish net stockings, a little black dress and some ghoulish make-up and hair, and we’re ready to meet our handsome Frankie at the Paper Crafts alter. Here comes the brides! What do you think of our official wedding portrait? As you can see, we had a very good time at the wedding! A special thanks goes out to “Frankie” for putting up with nine crazy, hormonal bridezillas! Here’s hoping your Halloween is a memorable one! P.S. Make sure you check back with us on Monday when we spotlight the three winners from our October Gallery Challenge! 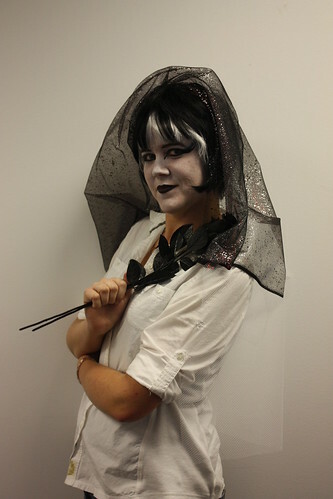 With 469 submissions, there was a lot of spooktacular projects to choose from! Welcome to Freebie Friday! Did you know that October 30, the day before Halloween, is known as Mischief Night? According to tradition, preteens and teenagers are known to play pranks on their neighbors as a way to kick off the Halloween festivities. Common pranks include soaping car windows, egging houses, adorning trees with toilet paper and running away after ringing doorbells. In the mood for some mischievous cards? 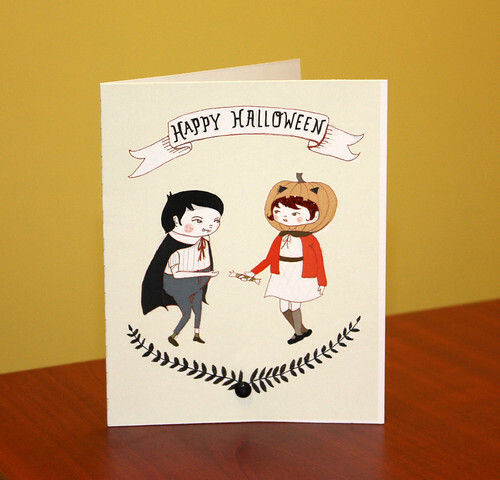 I recently came across these two Halloween cards from Paper Crafts Go-to Gal Maren Benedict. Featured in Card Creations, Volume 7, they both scream mischief and fun. Leave a comment telling me a mischievous prank you’ve pulled in your life. I’ll randomly select three winners to take home Cosmo Cricket’s Haunted collection – the same collection Maren used on these fun cards. All comments must be received by midnight (MDT) on Sunday, Nov. 1. 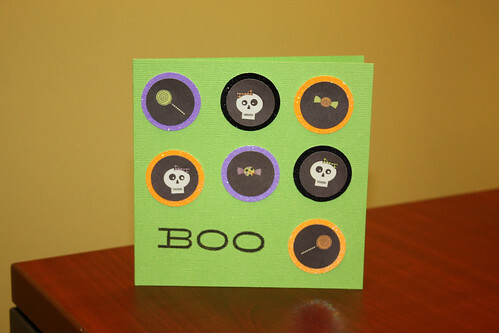 Maren Benedict's Spooky and Goofy Pumpkins Card from Card Creations, Vol. 7. 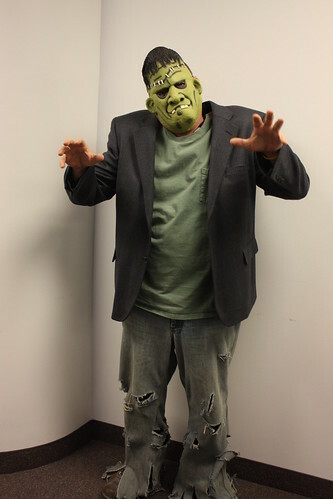 Speaking of mischief…our art director Matt has definitely been up to no good. Apparently all the long hours in his dark laboratory (office) have finally taken its toll. He now grunts when asked a question and lately there seems to be a lot of steam coming out of his head. To make matters even worse, he’s now taken up with seven crazy women! (well, nine if you count our impressionable interns!) Yes, Matt has become the misunderstood Frankenstein and we are his seven brides. How’s that for a team costume?! Look for a special blog post tomorrow, where I’ll reveal pictures from our day at the office as Mrs. Matt Anderson. 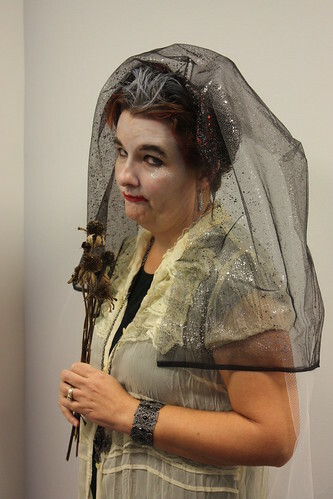 (Hopefully the real Mrs. Anderson is a good sport!) Congrats go out to Ellie Augustin (Sept. 22, 6:14 a.m.)! 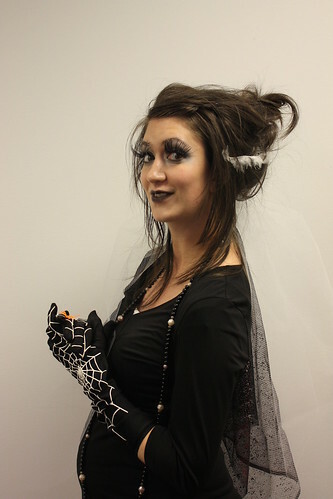 Even though we didn’t exactly go with her “Count Dracula/Vixen” idea (from Jennifer’s Merry Hallowistmas! post), she definitely inspired us to go down to the monster path. Ellie, I’ll be contacting you shortly to discuss your fun prize! Here’s to having fun (and being safe!) on Mischief Night! The kiddos are counting down the hours until they can wear their costumes, the grocery stores are brimming with yummy candy and bright orange pumpkins across the country are being carved into silly faces. Yes, Halloween is in the air. Luckily, it isn’t too late to make a few spooky cards to slip into your neighbors’ mailboxes or ship off to your loved ones. 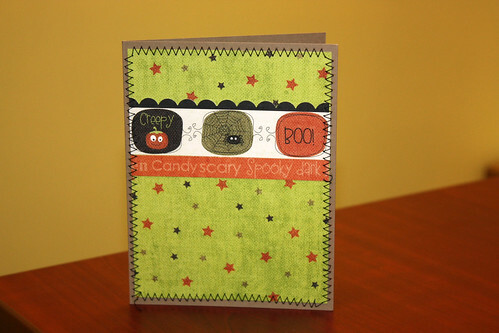 I met last week with my fabulous card group and we swapped some ghoulishly fun Halloween cards. 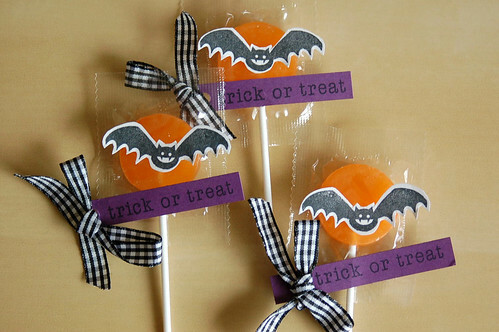 Perhaps these little morsels just might spook you into making your own creations for All Hallow’s Eve. 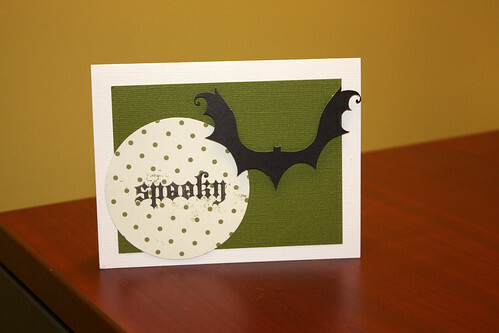 Spooky Bat Card by Roxanne B.
I was a bit pressed for time when it came to making my swap cards so I downloaded this card from Inside a Black Apple. I added a glittery brad to the bottom flourish and embellished the kids with glitter glue. The cards were super easy to mass produce and pretty dang cute (but I might be bias). P.S. 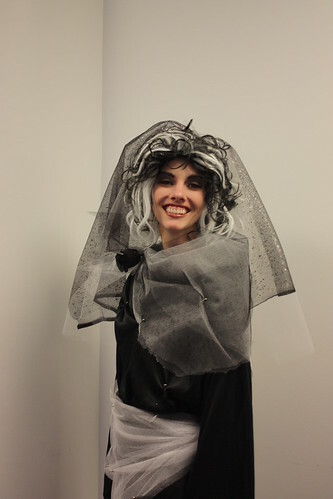 Make sure you check back to see the big Paper Crafts team costume reveal. It’s guaranteed to be frightfully fabulous if “I do” say myself…how’s that for being cryptic? P.P.S. It’s time to announce the winner of Susan’s Inspired By post! 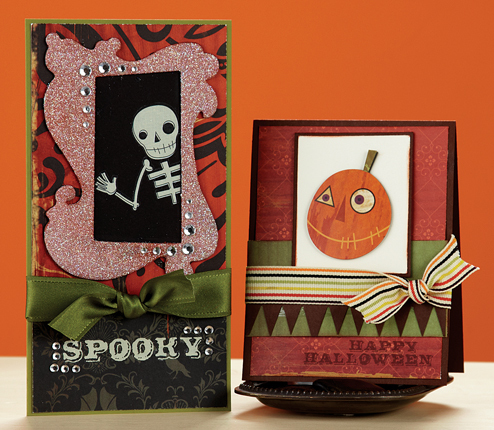 You’ve won some spooktacular Halloween projects that were featured in our September/October issue! Susan will be in touch shortly to get your mailing address. Thanks to all who left comments! The neighborhood kids know me as The Candy Lady. They know my house is not one to miss on Halloween. As long as they’ve been good neighbors the rest of the year, they’ll get an extra treat or two from me. A few special neighbors will get ones with a paper crafted twist this year. 1). Decorate the treat itself. I cut out the bats and applied them onto the suckers with Glue Dots. I adhered the sentiment strips the same way. 2). 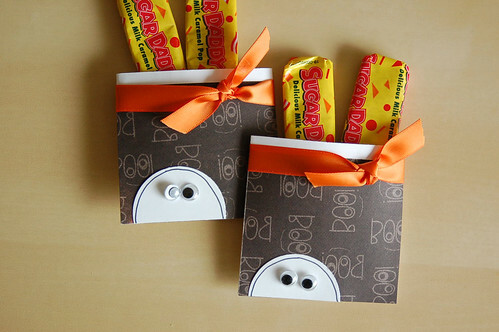 Make a card and mount a treat to it. I created the cards here from cardstock and patterned paper. I mounted the suckers right on top of them with Glue Dots. The ghosts are stickers so I stuck them right onto the suckers’ clear packaging. 3). Create a pocket and fill it with treats. I used small envelopes to make these pockets. I cut off the envelopes’ tops and then decorated and filled the envelopes with treats. Please note that for each of these treats that I didn’t compromise their packaging in any way. I just added things onto the packaging. I hope these treats will bring a smile to my neighbors’ faces this year. I hope they will bring one to you, too. Do you have any Halloween plans? 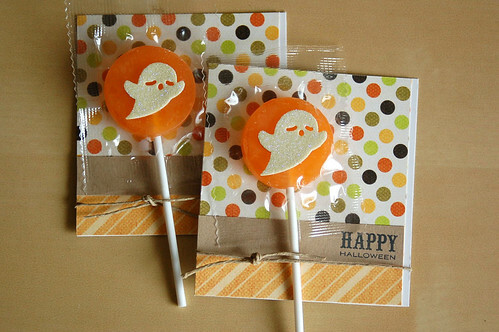 Are you making any special Halloween treats? I’d love to hear from you today. P.S. I’m happy to announce a new gig for the Paper Crafts Go-to Gals! In an effort to stay connected with all of our online friends, each of the six Go-to Gals have become online ambassadors for the magazine. What does this mean? Well, we’re going to be popping up all over the World Wide Web. From the Paper Crafts message board to your favorite hang-outs like 2Peas, Scrapbook.com, Splitcoaststampers and the Paper Crafts magazine and Moxie Fab World Facebook fan pages, we’ll be stopping by to say “hi”. We’ll even also host some fun challenges on our personal blogs! Each Go-to Gal will start their week of ambassorship on Wednesday (the day our Groovin’ with the Go-to Gals post goes live) and continue through the following Tuesday. We hope you enjoy staying connected with us! Congrats, winners! Kelly will be contacting you shortly to discuss your prizes. Thanks to all who left comments! You know what’s fun to me about Halloween? I love the opportunity to dress up like somebody else while giving it my own twist. Take last year for example. I dressed as Hester Prynne, the protagonist of Nathaniel Hawthorne’s The Scarlet Letter (forgive me – former English teacher here!). 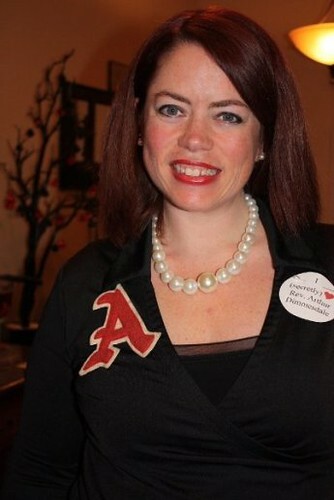 Instead of dressing like a full-fledged Puritan woman, I incorporated my chenille cheer letter from elementary school (the scarlet letter) and wore pearls to represent Hester’s daughter Pearl. Every issue of Paper Crafts magazine gives you the opportunity to dress up your cards with your own unique twist. Have you ever browsed through a Paper Crafts magazine or special issue and created a card or project inspired by one of the designs you saw in the publication? Maybe you took the design of a birthday card and made it into a Valentine, or maybe you switched up the colors to take a Mother’s Day card to a Father’s Day card. We want to hear your story and see your creation! Here’s what I’m talking about. I love this project by Cari Fennell in our September/October 2009 issue on page 42. The design is timeless and can be recreated in a variety of ways. I decided to turn it into a Thanksgiving card that I can send to my parents. Mine isn’t quite as pretty as Cari’s, but you can see the correlation (I hope!). So I introduce to you Inspired By! Thumb through the pages of a Paper Crafts publication (magazine or special issue) and create a project inspired by one that you see. Submit an image of your Inspired By project HERE, tell us where we can find the original in our magazine, and you just might have your card featured in the Paper Crafts Connection section of one of our issues. Why not give it a shot? To celebrate this week of Halloween festivity, I have a prize package of spooky projects from Melissa Phillips and Mary Bieber that were featured in our September/October 2009 issue for one lucky commenter. You could win all of these projects by leaving a comment! Leave a comment and tell me about a project that you’ve seen in the pages of a Paper Crafts magazine that you are inspired to recreate with your own twist! All comments must be received by midnight (MDT) on Wednesday, Oct. 28th. Get Inspired by Paper Crafts magazine! 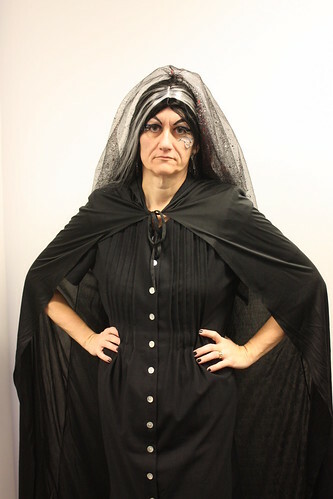 So without further ado, let’s get to know the bewitching Lisa Johnson! I grew up in Alaska – the Chugiak/Eagle River area. I was born in California though, and spent a lot of time there also. Nope, but I volunteer in schools and am very involved in my church. My girls wouldn’t hesitate to say Reese Witherspoon – with brown hair. (I don’t see any resemblance beyond us both being short.) I can’t imagine them making such a boring movie though. LOL! I have to laugh…my girls screamed out the theme from Mission Impossible! LOL! (Should I be offended?) I think it’s more like Singin’ in the Rain. I do try to find the happy in life. Most people are surprised when they hear me sing…I have a very full alto voice. My talking voice is more on the Minnie Mouse end of the spectrum! My good friend Joan invited me over for a stamping party…that was the beginning of it all! Scrapbooking! I’ve just never found my groove. I recently took a great photography class so that might change! ONLY TWO? Sheesh…Okay, um…stamps (and ink since you have to have ink to stamp, right? So they really are one in the same!) and a synthetic sponge. I usually add depth by lightly sponging my cardstock edges. LOVE IT! This may sound strange but I love Just Because. There is something so inspiring about creating a project for someone with the sheer intention of brightening their day! This is always a hard question for me to answer…I don’t think I have a specific style. I like clean and simple, vintage, detailed, glam…I pretty much love it all! I’ve heard recently from my friends that my style is clean and classy though. 11. When is your favorite time to craft? After lunch and reaaaaaaly late at night! None! I start dancing and singing and can’t create or design. I do listen to audio books and watch movies though. Well, the mere fact that I have four daughters sort of answers that! I have supplies set aside in a drawer just for them, and an area in my studio. We make everything from cards for their friends to birthday gifts. We are a bunch of busy bees! I print them and put them in order on a clipboard that I hang from my studio desk. I also add the dates to my computer calendar and send myself e-mail reminders the morning of the call so I don’t forget to actually submit my projects! I pretty much assume I will forget unless it’s e-mailed in a reminder to me…so I do it with every appointment and deadline! Oh my…this really ages me! My first project ever published was for the 2005 Stamping Royalty Card Contest. I think my style may have become just a little more detailed since then. I have been blessed to be able to work with We R Memory Keepers, Webster’s Pages and Prism. I’ve also done contract work for Tsukineko, 7gypsies and a few other manufacturers. Debbie Olson – Everything Debbie creates is so full of depth and exudes a solid sense of design. I’ve watched her for so many years in awe. Her work is full and decadent! 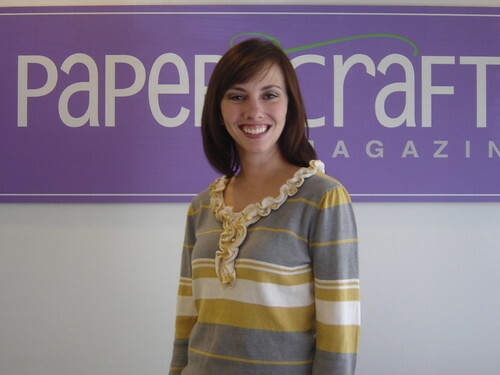 Nichole Heady – When I first started being published, a friend pointed out to me how amazing this Paper Crafts designer was. I started taking notice and fell in love with her immaculate and innovative creations. Always perfection in paper! 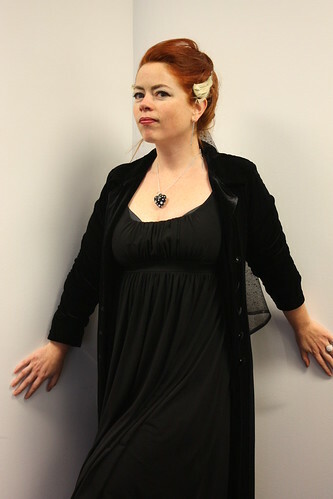 Melissa Phillips – Have you ever seen someone’s style that was so different from your own and fell in love? Melissa’s warm, eclectic, vintage touches and candy sweet creations exude her equally sweet personality. Guiltless pleasure! The best thing to realize is that just because it’s not picked up doesn’t mean it’s not good! Have faith in your work and keep trying. It just might not have met the editorial needs at that time. 19. Do you have a blog or online gallery? If so, please provide the URL. I do have a blog (www.poppypaperie.typepad.com). Please hop on over! Thanks, Lisa! 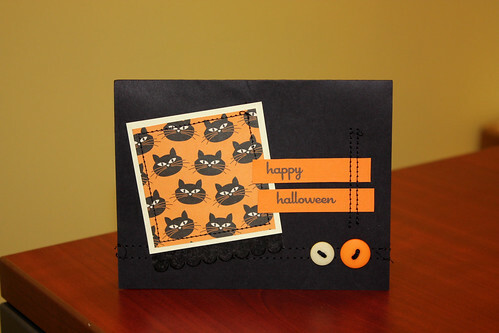 Your Halloween projects are simply boo-tiful! If any of you are looking for something sweet to put in your treat containers, make sure you check out Lisa’s “Spooky Sweets” post. Leave a comment for Lisa here and I’ll pick three lucky winners to win a sweet surprise! All comments must be received by midnight (MDT) on Tuesday, Oct. 27. Here’s to the sweet life! P.S. If you’ve been inspired by Lisa’s Halloween projects, why not make your own and upload them to our October Gallery Challenge? The deadline is midnight (MDT) tonight, so don’t delay! P.P.S. It’s time to announce the three winners from Cath’s Meet Our New Graphic Designer post and the three winners from my Boo Crew post! Welcome to Freebie Friday! As you probably already know, we take holidays very seriously around here. Maybe it’s because we put so much thought into covering them in our regular and special issues (usually six months ahead of time! ), that when the real holiday comes around, we feel like we have to acknowledge it a big way – just so the circle is complete. 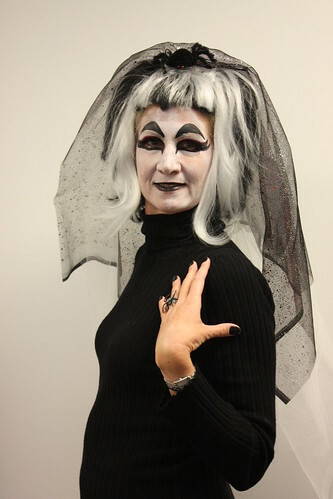 Here at the office we’re finalizing the details for our team Halloween costume. And while I can’t reveal what the actual theme is (there’s a lot of Creating Keepsakes spies around here! ), I can tell you it’s absolutely perfect for our team of eight women and one man. (I know some of you think you know, but it’s not what you think!) Let’s just say when next Friday rolls around, we’re going to give the CK team a run for their money in our company’s annual Halloween costume contest. We’ll show you pictures the following Monday! For all of you moms and grandmas out there who plan on making your child/grandchild’s costume, I tip my hat to you. My own grandma is an amazing seamstress and made so many of my costumes growing up. Sadly that sewing gene was not passed down to me – even despite her best attempts to teach me. I wonder what happened to that little sewing machine she bought me? 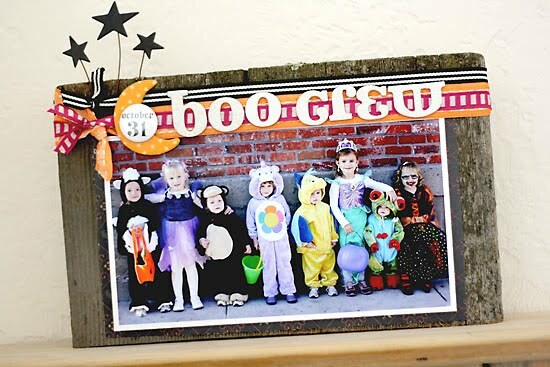 Back to the kiddie costumes… I was leafing through our September/October issue and came across Davinie Fiero’s Boo Crew Halloween Decor on p. 32. Is that not the cutest picture/project you’ve ever seen? And it’s 5 steps or less! Make sure you click on Davinie’s blog to read the cute story behind the photo and to see the layout she created using a similar image. 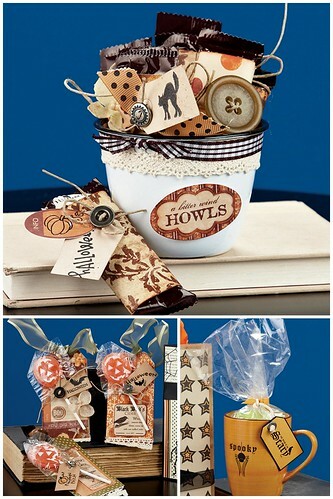 Davinie Fiero's Boo Crew Halloween Decor from our Sept/Oct issue. Recently I came across this team picture from last year’s Halloween festivities. 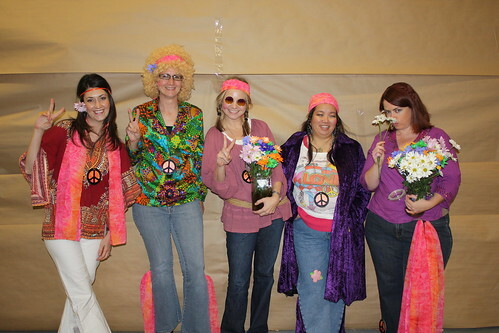 I’m thinking about recreating Davinie’s fun project and instead of the cute kiddos, it will be the groovy PC chicks! What do you think? So while I won’t be sewing my costume this year (or any year to come! ), I can definitely have fun paper crafting my priceless memories. 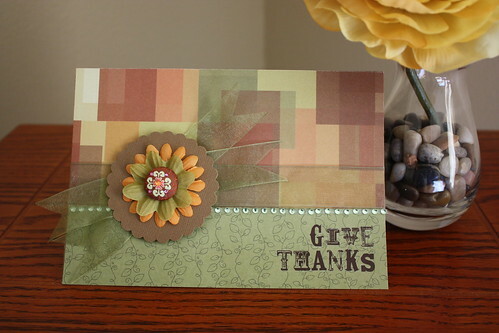 For today’s giveaway, I have three sets of the Craft Fair collection from American Crafts. For all you crafty sewers out there, this collection is right up your alley! And even if you don’t sew, it’s still some cool product to play with! To be entered to win, leave a comment telling me a talent you possess. Whether you’re a butcher, baker or candlestick maker, I want to hear all about it! All comments must be received by midnight (MDT) on Sunday, Oct. 25. P.S. If you plan on making some fun Halloween projects this weekend, why not enter them in our October Gallery Challenge? We have almost 400 entries so far! The deadline is midnight (MDT) on Monday, Oct. 26, so don’t delay! P.P.S. It’s time to announce the winner of Kim Kesti’s The Christmas Rush post! Congrats, Heidi! You’ve won all of Kim’s cards featured in this post! I’ll be contacting you shortly to get your mailing address. Thanks to all who left comments! Meet Our New Graphic Designer! Paper Crafts has a new family member! Holly Mills joined us a couple of weeks ago as our new graphic designer and we couldn’t be more thrilled! We’ve been having fun getting to know her and thought it was high time that you got to know her as well. Here she is! Take it away Holly! How did you get from “there” to “here”? I started my college education a long time ago at Snow College in central Utah. After two blurry years of chasing boys more than course work, I transferred to Weber State University in Ogden, Utah, which is where I finished my education. My degree is a composite of three minors. I chose Art History, Ethnic Studies and Multimedia with the intention of pursuing more education in Art History and becoming a curator in an art museum. As time passed, however, I realized I enjoyed monkeying around in design software much more than writing 20-30 page papers on the aesthetics of rock art (although I do think there is much value to the subject – it just wasn’t meant for ME to write about it). My first job after college was working as a production artist for an advertising company. I learned a lot. Perhaps, most importantly, I learned that I wanted to investigate this career further. My next position was as a designer for a company that develops software and training for emergency dispatch centers. I worked in the translation department and did design for training materials in multiple languages. I only speak English. There were new challenges to be conquered, but the type of work was the same and still had my attention. I learned a lot–again. After a couple of years working under strict and technical design guidelines, I decided it was time to expand my horizons and explore a career with more imagination. I think I’ve landed in the thick of it. Paper Crafts is a hive of creativity. I feel completely out of my element and I’m loving it. Once again I’m encountered with a learning curve, but I couldn’t be more excited to be here for it. OK. Now that we know your “serious” side, let’s get down to the nitty gritty. How old are you? Carbs–with a brownie on top (corner piece preferably) and some hot chocolate to wash it down. I just finished The White Tiger by Aravind Adiga–it was AWESOME! In which store would you choose to max out your credit card? Just one store? I could blow lots of money online at sites like Etsy or Amazon. What do you do most often when you’re bored? Catch up on bad wedding TV–I confess Bridezillas is a guilty pleasure of mine–and I blog stalk. What is one thing most people would be surprised to hear about you? Other than my age? Perhaps my mischievous side. Holly was even game to stand on the lobby couch for her close-up. Not only is she a little bit mischievous, but she's also a little bitty thing! Where is the farthest you’ve been from home? My cat and my dad. Cowgirl and champion barrel racer. In my dream world, I’d like to be a philanthropist. In reality, I’d like to continue discovering and developing new creative outlets. It would be cool if that involved being outside and working on my tan at the same time. Join me in welcoming our new girl to the team! 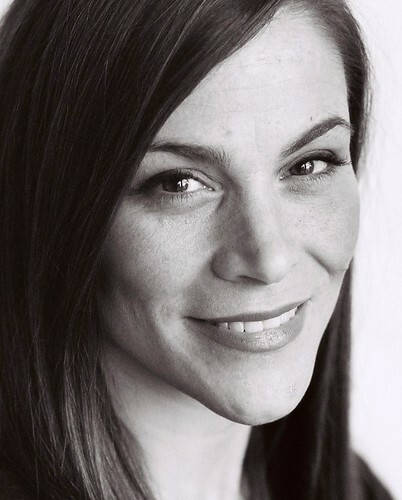 Holly has agreed to join our blog rotation, so you’ll be hearing from this mischievous, carb-loving, cowgirl every month. Leave Holly some love by midnight (MDT) on Friday, Oct. 23 and I’ll pick three random winners to take home either the Plastino, Super Stud or Camped Out collection from Bella Blvd. P.S. Our May/June Call for Submissions was sent out yesterday! If you’re in the mood to design some fun summer projects, click HERE to read what we’re looking for! Okay, I suppose it’s not the official Christmas rush yet, but when October rolls around I usually start getting a little anxious about my Christmas cards. I like to plan them in October, take a Christmas photo and make my cards in November, and mail them out first week in December. This fall at Creating Keepsakes Convention, Paper Crafts magazine teaches a fun class called Kick Start Christmas. I taught this class recently when convention was held in Glendale, Arizona. It really inspired me to “kick start” my own card plans. And better yet, one of the techniques we teach in our class is how to make Christmas cards with non-holiday paper. I thought that was a really interesting challenge. So, when I got home I decided to try it. I’m really happy with the results. I grabbed a bunch of black, red and green scraps from my drawer and punched a whole batch of circles. I also choose a few creams for a neutral touch. I inked the edges of all the circles with black; this helped unify all the patterns. I stamped a little folksy bird (a non-holiday stamp) and a simple sentiment (both stamps are from Hero Arts). A bright touch of polka dot ribbon finished this guy off. 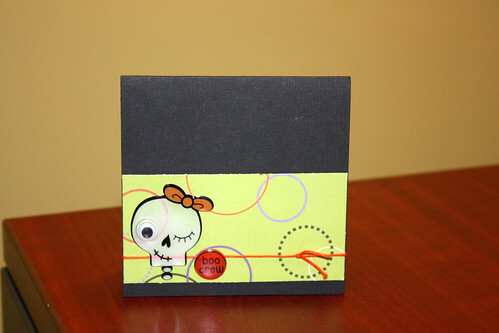 What a fun, simple and inexpensive card to reproduce! How are doing on your holiday cards? How about a little more inspiration? I’d like to send one lucky reader the card pictured above plus these previously published cards. 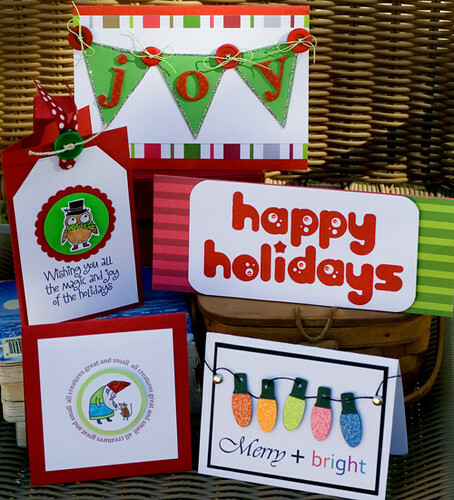 One lucky winner will take home ALL of these festive cards! Just leave a comment below about your holiday card making adventures and you’ll be entered to win! All comments must be received by midnight (MDT) on Thursday, Oct. 22. Would you believe that 98% of our readers – at least the ones who respond to our annual survey – are stampers at some level? I think it’s the versatility of stamping that is so appealing. After all, you can make background paper, stamp a sentiment, color a stamped image with markers and do it all in a rainbow of colors, too. 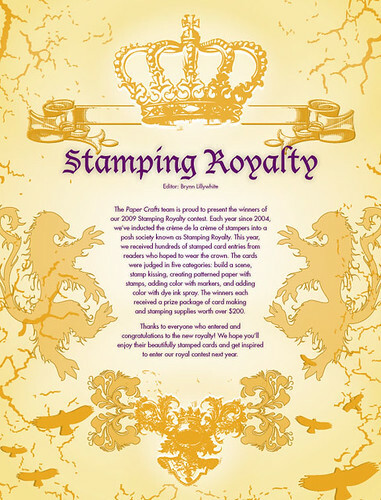 For this year’s Stamping Royalty Card Contest, we asked for card designs in five categories (see the full list below) and got hundreds and hundreds of entries. The 15 lucky winners got a fantastic prize package worth over $200, plus a tiara and custom-made tote bag. 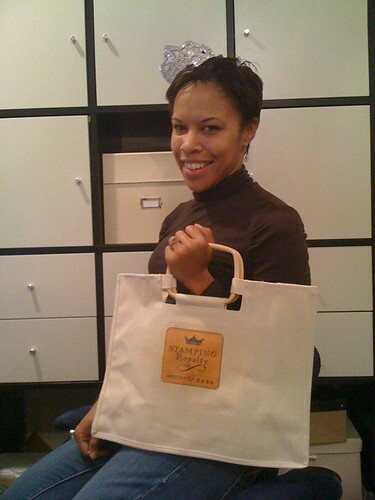 Here's winner Ashley Newell modeling her official Stamping Royalty tiara and tote bag. All hail Queen Ashley! …and turned it into a lovely spring scene with markers and some detail work. Below is the full list of winners, and in case you missed the feature in our November/December issue, you can see all 15 cards HERE. Congratulations to our 2009 Stamping Royalty! Click on the image to see the entire feature online. P.S. If anyone will be at the Creating Keepsakes Convention in St. Paul this Friday and Saturday, come and find me to say hello!